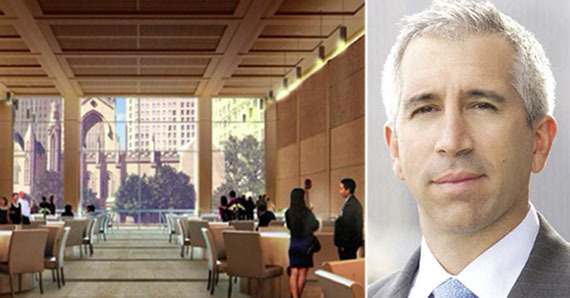 The developer planning a supertall tower in the Sutton Place neighborhood of Manhattan lost a key decision in court Tuesday, paving the way for a foreclosure auction of his properties. Joseph Beninati was denied a temporary restraining order that he had sought to block lender Gamma Real Estate from seizing or auctioning off his properties at 428-432 E. 58th St., three contiguous five-story apartment buildings. In January, Beninati, founder of Bauhouse Group, defaulted on a $147.25 million loan from Gamma, a firm controlled by real estate investor N. Richard Kalikow, after trying unsuccessfully to sell the site or refinance it. The court’s refusal to grant the restraining order was a major blow to Beninati. “We have spent two years of time and millions of dollars,” said Beninati, who looked deflated outside the courtroom in lower Manhattan Tuesday afternoon. Gamma’s attorney in the case, Ronald Greenberg of the firm Kramer Levin, disclosed that nine bidders planned to participate in the foreclosure auctionscheduled for Feb. 29. Beninati could conceivably recoup some of his investment in the site if a bidder agrees to pay a sum in excess of what Gamma is owed. However, Beninati didn’t see that as a likely outcome. Beninati’s lawyers, Stephen Meister and Kevin Fritz, accused Gamma of improperly marketing the properties to potential buyers in order to enhance its chances of taking over the site. Some real estate executives who have followed the case expect the properties to end up in Gamma’s possession after Monday’s auction—an outcome that would wipe out Beninati’s investment in the project. Beninati’s problems come as both real estate lenders and buyers have begun to pull back on construction of high-end condo projects owing to increasing concerns that the condo market may be slowing as an oversupply of newly built multimillion-dollar apartments come up for sale. Beninati envisioned demolishing the three buildings on East 58th Street and erecting a 950-foot-tall, ultra-luxury condo tower on the site—a plan that has sparked outcry from some of the project’s neighbors and city officials. In court, representatives for Gamma acknowledged the project’s challenges. From the outset, Trinity Church’s decision to develop a luxury condominium in Lower Manhattan seemed at odds with its commitment to community service and low-income housing. Now, the Episcopal church has quietly scrapped plans for a residential tower at the site of its 90-year-old parish building, where it will instead build a community center and offices. Gone are the condos. New plans call for a 145,000-square-foot mixed-use building at 74 Trinity Place, church officials and architects disclosed during a community meeting held on Feb. 21. The building will house more than 98,000 square feet of community space, including classrooms, gym facilities, a café and a formal meeting room with floor-to-ceiling windows that face the historic Trinity Church directly across the street at 75 Broadway. Throughout its planning process for the site, the church has sought community input via a series of “charettes,” a term for design meetings with community stakeholders. “Without the charette process… we might have built the wrong building,” architect Fred Clarke of Pelli Clarke Pelli said at the Feb. 21 meeting. Early plans called for a nearly 300,000-square-foot tower with six or seven stories reserved for the church’s offices, topped by a 25-story residential portion. In 2013, Trinity tapped Pelli Clarke Pelli to design the building, and said it was seeking a development partner to execute plans for the residential component. But local residents opposed the residential portion, saying it looked out of place. They also expressed concern over an onslaught of residential development in the area, including Time Equities’ 50 West Street and 125 Greenwich Street, being co-developed by Bizzi & Partners, Michael Shvo and Howard Lorber’s New Valley. Last year, Trinity commissioned the GillWright Group to conduct a community study, which contributed to its decision to retool its plans. Church officials first signaled plans to scrap condos at a Nov. 21 charette, when Lupfer referenced the influx of residential development in Lower Manhattan. “We have not found a crystal ball to project the future… so we want to have the kind of space and finishes that can be changed over time,” he said. The Hudson Square/West Village submarket commanded asking rents of $69.75 per square foot during the fourth quarter, with a 6.7 vacancy rate, according to Cushman & Wakefield. Trinity – whose ownership of more than 200 acres of Manhattan real estate dates back to the 1700s – is one of Hudson Square’s major office landlords. Last year, the church sold a stake in its 5 million-square-foot portfolio to Norway’s sovereign wealth fund for $1.56 billion. The deal valued 11 of Trinity’s buildings at $3.55 billion, as TRD reported. Trinity officials said at the time that diversifying the church’s assets was “critical” to sustaining the ministry’s operations. A midtown south building on West 23rd Street is quickly becoming a haven for tech companies. Grovo, which provides clients with online training for employees, has signed a 10-year lease for 70,000 square feet at 50 W. 23rd St., a building owned by Two Trees Management. The company will be taking the entire fifth, sixth and 12th floors at the 13-story, 340,000-square-foot property. Asking rents at the building are above $70 per square foot. The firm will be moving out of 3 Park Ave., where it has 29,000 square feet. Two Trees is best known for its projects in Dumbo, helping to establish that Brooklyn neighborhood as a popular location for both residential and office tenants. Recently, the company has focused on 50 W. 23rd St., a property it purchased in 2010. Walentas said Two Trees has invested about $25 million into renovating the building over the past three years. The improvements include upgrading the lobby, installing more sophisticated heating and ventilation systems and the addition of a 11,000-square-foot roof deck. With the Grovo lease, Two Trees said, the building is now about 90% occupied. The deal follows two other recently signed leases with tech firms:Dropbox, a cloud computing and storage company, took 31,270 square feet at the building in December, and SoundCloud, the online music platform, took 43,000 square feet there in the summer of 2015. Dan Conlon and Elizabeth Bueno, in-house leasing executives at Two Trees, represented the landlord in the deal. Eric Ferriello and Robert Tunis, brokers with Colliers International, represented Grovo. Ferriello was also the broker who represented SoundCloud in its lease.